Kaiser's Quality Management System (QMS) consists of management, core production and support processes, and document control. We are dedicated to the continuous improvement of our QMS through internal audits and corrective action activities and the monitoring of customer satisfaction. ISO 9001 is intended to establish, document, and maintain a Quality Management System through ensuring the output quality of a process. 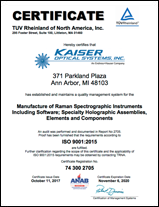 ISO 9001 registration is visible evidence of a company's commitment to quality that is valued, accepted, and understood throughout the world.